THE HAGUE - The First Chamber of the Dutch Parliament, the Senate, is keeping pressure on the Dutch government to make haste with releasing the research report to set a benchmark for the social minimum in Bonaire, St. Eustatius and Saba. 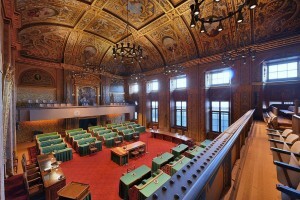 The Senate’s Permanent Committee for Kingdom Relations sent a letter to Dutch State Secretary of Social Affairs and Labour Tamara van Ark on Tuesday, asking that she do her utmost to present both the results of the research into the social minimum and the Dutch government’s reaction to this report before June 1. In the letter, the Senate’s Committee indicated its disappointment in the late delivery of the report and the general delay in the handling of this matter which is highly important to the people of the three islands, especially to those who live in poverty. “We are asking the State Secretary to make the utmost effort to present the report and the cabinet’s reaction before June 1, and if that date proves impossible we want to know why there is a delay. In any case, we want to have the documents before July 1,” Committee Chairman Ruard Ganzevoort of the green left party GroenLinks told The Daily Herald on Wednesday. Van Ark informed the Dutch Parliament on May 1 that she had not made the May 1 deadline to publish the research report. She gave as a reason that more time was needed to allow the governments, in particular the sounding board group, to share their views on the draft report. She also opted to have the report accompanied by the cabinet’s reaction, which would add to the delay. She did not provide a new date when she would release the report and cabinet reaction. State Secretary of Home Affairs and Kingdom Relations Raymond Knops promised the Second Chamber during a debate last week that together with his colleague Van Ark he would try to have the documents at Parliament before July 1. In the letter to Van Ark, the Senate’s Committee made clear that it wants to assess the report and the cabinet’s reaction as soon as possible, because almost the entire First Chamber, except for the Party for Freedom PVV, supported the June 28, 2016, motion to establish a social minimum for Bonaire, St. Eustatius and Saba based on benchmarks for the basic necessities. This has been a struggle for two years, but the Senate is adamant in its desire to do something about poverty on the islands. “Poverty is a real issue and eradication of it requires a structural approach. Poverty should not exist in the Kingdom,” said Ganzevoort. The Senate generally believes the policy to eradicate poverty needs to be based on concrete figures and facts. An objective picture of the subsistence minimum, the minimum that one needs to survive, should be the basis for social policies on the islands, based on which measures and decisions can be taken. A precise calculation is needed, said Ganzevoort. The Senate’s Committee also decided during Tuesday’s meeting to call in Minister of Foreign Relations Stef Blok and State Secretary Raymond Knops for a meeting in the near future to discuss Dutch foreign policy regarding Latin America and the Caribbean. The crisis in Venezuela, facilities for refugees from that country in Aruba, Curaçao and Bonaire, and the Dutch/Kingdom response is the main reason the Committee wants to have this meeting. The proposal for this meeting came from Senator Thom de Graaf of the Democratic Party D66. Several components come together in this issue: foreign policy, border control and immigration. The countries in the Kingdom each have their own tasks and authority, but in this case the different layers of responsibilities mingle. The Committee wants to clarify who does what in the Venezuela issue and how the Kingdom can jointly solve this.